THE principal part of the town of Enniscorthy, including the Castle, with its grey towers, is situated on the side of a steep hill, rising above the river Slaney, county of Wexford. The town itself is built in great irregularity and variety of outline. It has of late years been extended considerably. 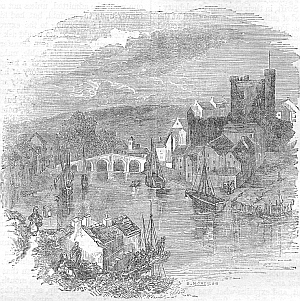 The Slaney, which, from Enniscorthy downwards, is a large tidal river, is navigable for barks of considerable tonnage. To facilitate the trade by the river, two quays have been erected at a considerable expense. The town witnessed many sanguinary scenes during the unhappy events which characterised the year 1798. The Castle of Enniscorthy, seen to the right of our sketch, was originally erected by Raymond le Gros, and is one of the earliest military structures of the Anglo-Norman settlers. It is a very remarkable building, as well from its commanding situation as from its architectural peculiarities. -- The body of the edifice is of a square form, flanked at each corner by a round tower. It appears that the castle and manor were formerly possessed by the O'Kavannaghs, and subsequently granted by Queen Elizabeth to the poet Spenser. It was taken and destroyed by Cromwell, and afterwards repaired by Sir Henry Wallop. A fragment of the Franciscan Convent is all that remains of the ancient churches which were erected here. 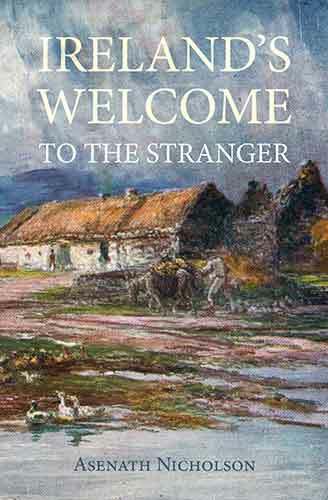 There is no scene in the county Wexford more beautiful than the rich valley above and below Enniscorthy, through which the Slaney flows. As the river occupies the greater portion of the valley, the principal part of the town reaches along the abrupt banks on either sides, the streets being consequently in several places inconveniently steep. A magnificent view of the town, river, and country around is obtained from Vinegar Hill, which adjoins the town, and rises to a height of 389 feet above the sea level.